While I have shared quite a bit of the progress on my new house over on SnapChat, I haven’t actually shared all that much about the interior design or inspiration for the look of each room. I haven’t purchased much furniture yet, but I’ll be getting on that very soon! I’ve been waiting until we re-sand and stain the wood floors next week, because you’re not supposed to put furniture on it until it sets for at least a week. With that said my living room is probably the furthest along in terms of what I’ve purchased. 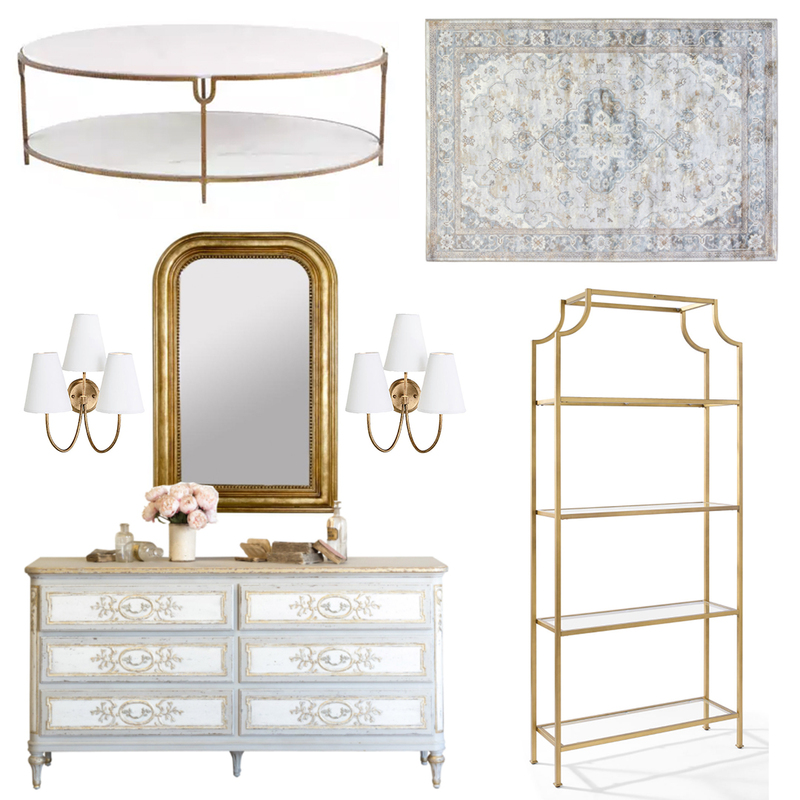 My interior designer, Maddie Hughes, has been a huge help in sourcing a lot of these items, and has come up with some great ideas for making the house my own! The first thing I ordered was my marble + gold coffee table, which I happened to discover was on sale! That’s why I pulled the trigger on that one early. Next, I ordered this gold etagere, which is actually pretty reasonable if you ask me. One of the big concerns I had with this house was the lack of storage, so I’m incorporating shelving everywhere I can think of! This etagere is going to be a great spot to feature books, decorative objects, etc. After that I picked up a mirror nearly identical to this one. I hadn’t decided whether I wanted the mirror to go in my office or my living room, but ultimately decided it would look best on the large wall facing my front door in between a couple sconces. Originally we had planned to do more ornate sconces here, but I fell in love with these triple-prong sconces and the sleek, simple look they offered. They should be arriving next week! My most recent purchase (that was just delivered yesterday!) is my beloved oushak rug Maddie and I found at Farzin Rugs in Dallas. Upon entering the store I was met with mostly dark antique pieces, which was not the look I was going for. Luckily they had a few in the back that were not on display, and surprised me with this beautifully neutral piece that looks absolutely perfect with the paint color in my living space. I don’t know about y’all, but finding the right rug has been the most difficult item thus far! 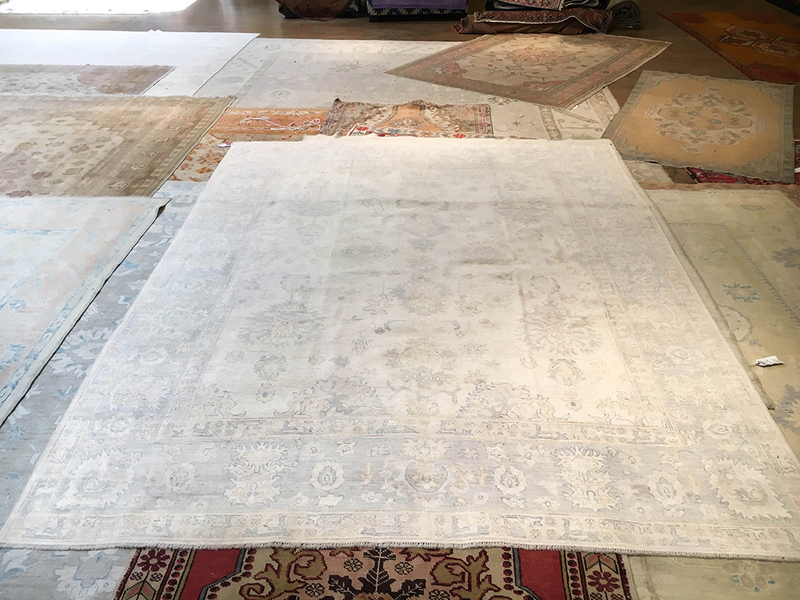 The rugs all look so different in natural light than they do online and dark rug stores (most do not have windows to preserve the rugs!). 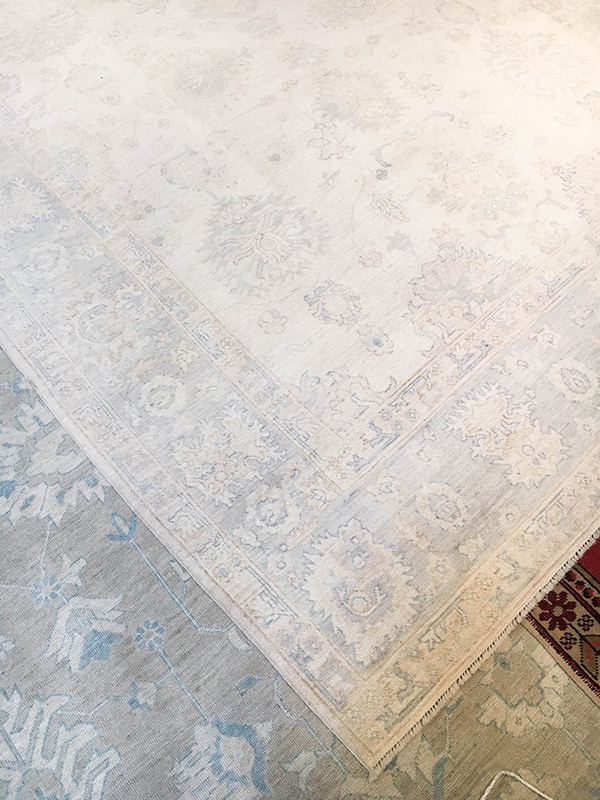 What’s great about Farzin was they brought the rug by my house to roll it out so I could see what it would truly look like in my house – that’s when I decided to buy it! 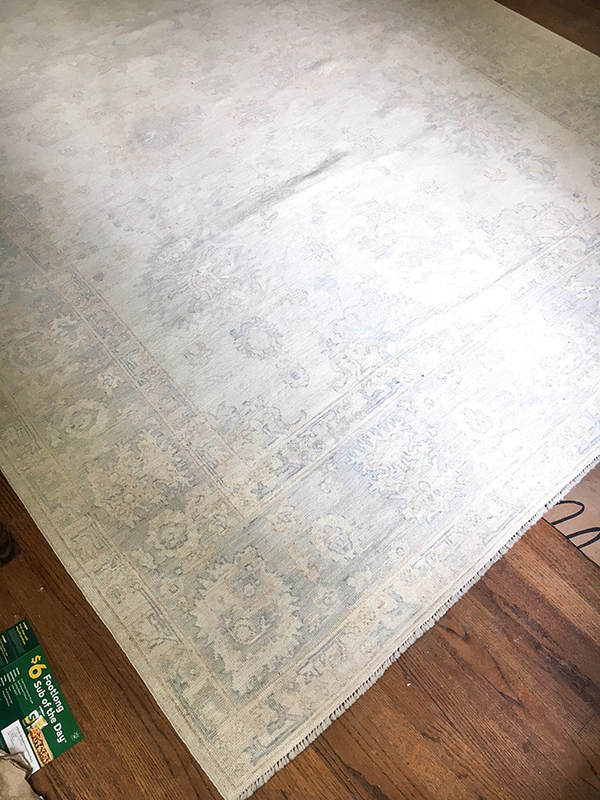 Unfortunately my rug was one-of-a-kind so I can’t actually link it for you, but this rug has a similar color scheme to the one I found. You can see photos of my rug below! The last thing you’ll see in this little collage (but probably the first thing that caught your eye, right?) is this Eloquence dresser. I haven’t purchased it (it’s very pricey!! ), but I really, really want it. It’s got that rustic French look I love, and I feel like it would tie everything in the room together extremely well. It’s incredibly glamorous, but there’s something subtle about it that calms down all the gold I have in the room. I just LOVE it! A dresser/console, sofa and a pair of lounge chairs are the three big things I have yet to invest in for my living room. For the sofa and chairs, I know what style I’m going with, I’ve just been waiting on the rug to be delivered so I can bring fabrics to compare to it. I’ll be having both items made using Maddie’s go-to upholsterer. I’m also waiting on my drapes, which hopefully will be done soon! I’ll be doing acrylic and brass rods in my living room, dining room and master, and will be hanging clean white drapes to match the wall color. What do y’all think so far? I’m excited to do a room reveal once I’m in and all of the items have arrived, but until then keep an eye out on SnapChat and InstaStories! Seriously love all these pieces!